Home Articles Settings Default or Custom NBA2K Game Sliders? 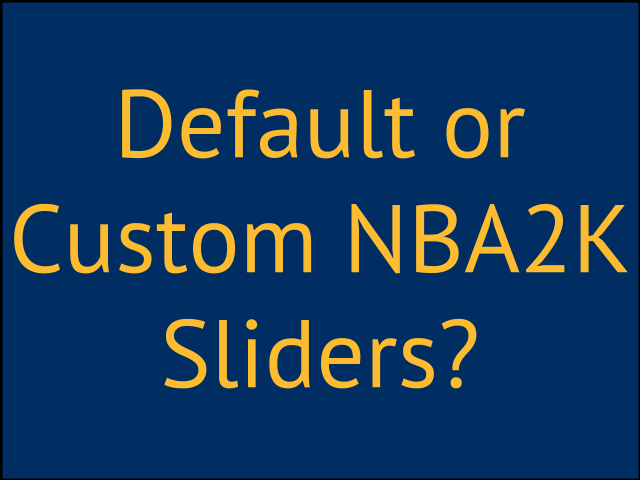 Default or Custom NBA2K Game Sliders? If you poke around the NBA2K game options, you will find something called the "game sliders". You can really get into customizing your game style by messing around with these sliders to get exactly what you want out of the game. I personally don't touch these sliders and leave them at what they are originally set at. If you spend any time online researching NBA2K, you will find basically two camps of people - those who never touch the game sliders and those who do. These two groups of people are also easy to find. 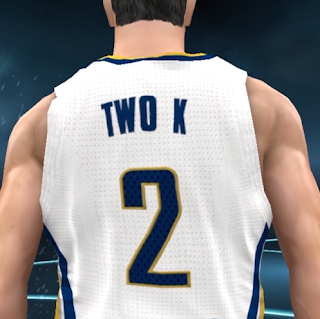 To find the people who don't touch them as much, go to the 2ksports forums. And for the group of people who do adjust them, head over to the Operation Sports forums. Go to the 2k forums and ask a question about how to do something and you most likely will get a technique like "use the controller to do" what you want to do. Ask the same question over at Operation Sports and you will most likely get someone to say "well, I adjust the sliders" to do what you ask. I personally like to refer to the guys at OS as "Slider Nation". I don't think there is anything really wrong with adjusting the sliders but I use the ones out of the box because if I ever want to play someone online, I want a consistent experience with the game both offline and online. Oftentimes I play someone new online in the play with friends section and they will leave the game style setting at "default" and I will ask them to put it on "simulation". Usually, they will say, "What's the difference?" Since I don't want to spend all day messaging on PSN about the difference I just say I play everyone on the same setting which is true. But there is a difference and I'll address that here in a moment. Within each of these divisions are the "sliders" you can adjust from a setting of zero to 100. Before I get into the differences between slider sets, let me first explain what a slider does. Let's say for a minute that you honed in on "3PT success". This slider changes the success on 3 point shots. You'll notice that it is set for 50. To keep it simple, if you set it at zero, then none of your threes will go in and if you set it at 100 then all of your threes will go in. The other thing that you can do is set one set of sliders for you, the user, and one for the CPU. TheKid does this all of the time. He'll crank up his for fun and then steal the ball all the time and sinks all of his threes. So What's The Difference Between Each Set Of Sliders? OK. So now you have a basic idea of how the sliders affect the game play. You can see that if you wanted to make the game a heck of a lot easier, then all you have to do is make a few adjustments and presto, the game is easier, or harder if you chose to do that for some reason. I will first go into the offensive set of sliders. Here you can adjust the following offensive sets: Inside Shot Success, Close Shot Success, Mid-Range Success, 3PT Success, Layup Success, Dunk Success, Dunk in Traffic Success, Pass Accuracy, Alley-Oop Success, Contact Shot Success. You can see that all of the default slider set is set at 50 while there are three differences on offense on simulation making it harder to shoot inside and if you get bumped and only one on casual making it easier to pass. Next up are the defensive sliders. Here you can adjust the following defensive sets: Driving Contact Shot Frequency, Inside Contact Shot Frequency, Help Defense Strength, Steal Success. Again, the default set is all at a value of 50 while simulation draws more contact and less steal success. This is important when playing another user. Notice if you play a user on default and they are spamming the steal button they would have much more success against you. Under the casual, there's just not as much contact and it's even more likely you will get a steal. Next up are the sliders for the player attributes. Those attributes are: Quickness, Vertical, Strength, Stamina, Durability, Hustle, Ball Handling, Hands, Dunking Ability, On-Ball Defense, Stealing, Blocking, Offensive Awareness, Defensive Awareness, Offensive Rebounding, Defensive Rebounding, Clutch Factor, Consistency, Fatigue Rate, Injury Frequency and Injury Severity. The next set of sliders apply to the player tendencies. These would adjust the following player tendencies: Take Inside Shots, Take Close Shots, Take Mid-Range Shots, Take 3Pt Shots, Attack the Basket, Look for Post Players, Throw Alley-Oops, Attempt Dunks, Attempt Putbacks, Play Passing Lanes, Go for On-Ball Steals, Contest Shots and Backdoor Cuts. The last set of sliders affects what kind of fouls are called and how often. Here are the fouls it affects: Over the Back Foul Frequency, Charging Foul Frequency, Blocking Foul Frequency, Reaching Foul Frequency, Shooting Foul Frequency and Loose Ball Foul Frequency. Basically, you can tell from the spreadsheet that there will be more fouls in simulation mode and way less in casual mode. What Set Of Sliders Should I Use Or Should I Use Custom Sliders? A lot of times, I will say that I use the default sliders. But what I am really saying is that I don't change any of the sliders and am using the ones that are preset in the game for simulation. I do this because I want to play on the settings found on everybody's game system. If I play my friend online or at his house, I want to be accustomed to a certain set of sliders that are consistent from game to game. For me personally, I prefer the simulation set of sliders because it's a tad harder than default in some important areas. I hope it's obvious that you wouldn't want to choose the casual set if you want a serious game. As far as using your own custom slider set, over at slider nation, you'll find a few people who have become famous for their sets of sliders and you can certainly check that out. I think that mainly those sliders are for if you are playing the CPU rather than other users. What's probably most important is that if you are going to delve into sliders is that you use the same ones all of the time and be consistent from mode to mode. This is why I go with the preset simulation game style sliders. No matter who I play or where, I know exactly what kind of game I will get. If you want my opinion then, you know that I am going to encourage you to just use the simulation sliders and leave it at that and resist the temptation to solve your game play problems by adjusting the sliders. It's a crutch more than anything I think. Besides, I think it means more to win on hall of fame mode on simulation sliders than if you did it by using a custom set - unless of course you made it harder! I hope that helps you understand sliders and how to use them. Let me know if you have any questions. I don't think that's possible for other players to do. Hey Coach.... I run an online league with HOF sim settings and 6 min quarters.... With the present sliders I noticed you can pretty much use your starters the entire game with well placed TOs.... What would you recommend for Stamina and Fatigue rate sliders? My commissioner adjusted stamina to 35. We did not adjust fatigue. However we run 12 minute quarters though so not sure how that'll affect your game. Might be tough to get true results at 6 minutes. You'll have to check back to see if we stay at that number as ours is a work in progress.